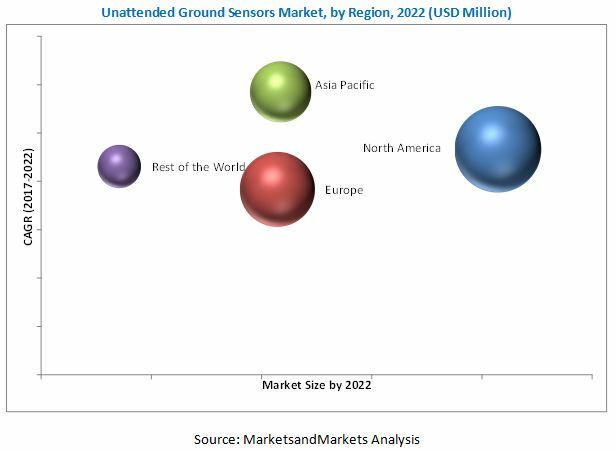 [127 Pages Report] The unattended ground sensors market was valued at USD 352.5 Million in 2016 and is expected to reach USD 457.9 Million by 2022 at a CAGR of 4.71% during the forecast period. This research study involved the usage of extensive secondary sources including directories; databases of articles; journals on unattended ground sensors, company newsletters; and information portals such as D&B Hoovers, Bloomberg, and Factiva to identify and collect information useful for this extensive, technical, market-oriented, and commercial study of the market. Primary sources are several industry experts from the core and related industries, OEMs, vendors, suppliers, technology developers, alliances, and organizations. These sources are related to all the segments of the value-chain of this industry. In-depth interviews were conducted with various primary respondents, including key industry participants, subject-matter experts, C-level executives of key market players, and industry consultants, among other experts, to obtain and verify critical qualitative and quantitative information as well as assess prospects. After arriving at the overall market size, the total market has been split into several segments and subsegments. 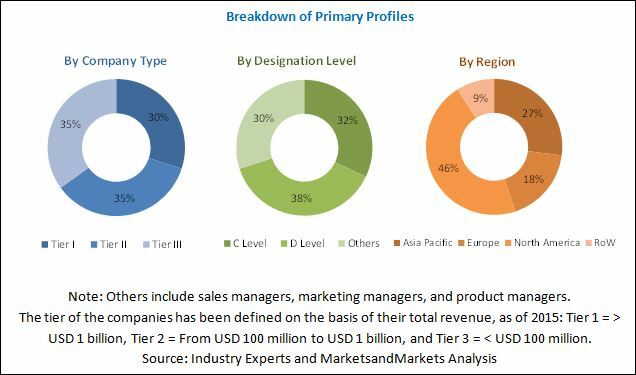 The figure given below illustrates the breakdown of primaries conducted during the research study on the basis of company type, designation, and region, conducted during the research study. The unattended ground sensors ecosystem comprises OEMs such as Northrop Grumman (US), Textron (US), Elbit Systems (Israel), L3 Communications (US), DTC (US), and others. The unattended ground sensors market is projected to grow at a CAGR of 4.71% from 2017 to 2022, to reach a market size of USD 457.9 Million by 2022 from USD 363.8 Million in 2017. This growth can be attributed to the changing nature of warfare and rise in the terrorism, geopolitical issues, and insurgencies across countries in the world. Based on sensor type, the unattended ground sensors market is segmented into seismic, acoustic, magnetic, and infrared. Seismic sensors is expected to be the largest segment of the unattended ground sensors market. These sensors provide direction of intruder’s movement, foot-borne, and vehicles based on seismic signature they produce. Also, recent technological advancements in the seismic sensor made it more efficient and less prone to false alarms. Security is the largest segment of the unattended ground sensors market, by end-user. Unattended ground sensors systems enable the military and public security forces to deter intruders from entering or crossing borders. Thus, the increasing applicability of UGS in the military and public security sectors is projected to drive the growth of the unattended ground sensors market. In this report, the unattended ground sensors market has been analyzed with respect to regions, namely, North America, Europe, Asia Pacific, and Rest of the World. North America is expected to lead the global unattended ground sensors market during the forecast period, owing to the increasing use of UGS in overseas combat operations carried out by the US Army in countries, such as Afghanistan and Iraq. Asia Pacific is estimated to be the fastest-growing market for unattended ground sensors from 2017 to 2022. The increasing demand for network-centric warfare systems from military forces of various countries in the Asia Pacific region is projected to drive the growth of the unattended ground sensors market in this region. China, India, and Japan are the key markets for unattended ground sensors in this region. China is the largest market in Asia Pacific. The People's Liberation Army (PLA) in China has undertaken various reforms to elevate Integrated Network Electronic Warfare (INEW) to a strategic level of combat. In India, the development of tactical command, communication, and intelligence systems by the Indian Army is a major step towards enhancing UGS capabilities, which is fueling the demand for advanced unattended ground sensors in the country. Unattended ground sensors are primarily used in the military sector; these sensors also monitor critical infrastructures, such as utilities and commercial & industrial facilities. The changing nature of warfare is one of the most significant factors projected to drive the growth of the unattended ground sensors market. The increase in transnational conflicts has led to a rise in the defense expenditure of various emerging countries worldwide. Territorial disputes and terror attacks in Asia Pacific, the Middle East, and Africa have led to increased investments by the government of countries in these regions to develop advanced electronic systems, such as UGS. However, the operational issues associated with UGS is restraining the market growth, and susceptibility of sensor networks to cyber attacks pose a challenge in the use of unattended ground sensors. But, growing need for enhanced situational awareness will positively impact the market growth. Leading players in the unattended ground sensors market include Northrop Grumman (US), Textron (US), Elbit Systems (Israel), L3 Communications (US), DTC (US), and others. Contracts & agreements was the strategy most commonly adopted by the top players, constituting more than one-third of the total developments from 2012 to 2017.